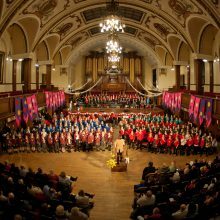 The Lancaster & District Schools’ Singing Festival, started over 70 years ago, has seen the most significant increase in the number of schools and children engaging with the Festival for 2019 with over 1400 children from 28 primary schools will taking part. The schools involved represent the diverse geographical and social groups within the region; from small rural schools, to large urban primaries. There is also the participation of SEND students from a specialist school within the community. Over a period of five years the Singing Festival has made great improvements to the festival function including having a live band for the festival and school workshops in the lead up to the festival performance. 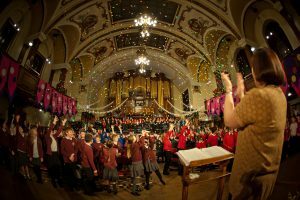 Each school involved is part of an exciting journey in singing and performing which culminates with a large scale show at Lancaster Town Hall where all the schools involved come together to perform their songs. The festival features performances from local KS4 and KS5 soloists and ensembles in the intervals, including musicians from LMH County Ensembles, local secondary schools and the Lancashire Youth Vocal Ensemble, which gives the children inspirational insight in what they can go on to do in music and song.